Age Limit: 18 - 26 years as on 21-08-2017. Ex-Servicemen; Persons with Disabilities; Widows; Divorced women and women judicially separated from their husbands and who are not remarried; Meritorious Sportspersons are eligible for age relaxation as per Govt. of India orders (http:llwww.nesac.gov.inldownload/ Important Notice jpa.pdf). 1. How to apply: The application for on-line registration will be hosted in the NESAC Website @ www.nesac.qov.in during the period from 22-07-2017 to 21-08-2017 Candidates may visit our website to register their applications on-line. Applications will be received on-line only. Upon successful registration, applicants will be provided with an on-line Registration Number, which should be carefully preserved for future reference. E-mail ID of the applicant will have to be provided in the application CORRECTLY and compulsorily. 2. After registration of application on-line, the candidates have to download and print the ‘application form’ which may be retained by the candidate for future reference. No documents to be sent, by any categories of candidates but will have to produce the relevant documents, as and when called for by NESAC. However, the candidates who are already employed under Central/State Govt.lPSUIAutonomous Bodies have to sent a ‘No objection certificate' from the employer concerned, duly indicating the Registration No. 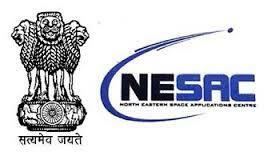 and Post Code to Administrative Officer, North Eastern Space Applications Centre (NESAC), Govt. of India, Dept. of Space, Umiam-793103 within 7 days from the last date of filing the on-line application form. 3. Selection Process: The qualification prescribed is the MINIMUM requirement and the same does not automatically make candidates eligible for written test. Based on the academic performance and bio-data, initial screening will be conducted. The written test will be conducted in the month of September 2017. Exact date will be informed later through NESAC Website. The call letters for Written Test to the short-listed candidates will be sent only by e-mail. Based on the performance in the Written Test, candidates will be shortlisted for Skill Test, depending on the number of vacancies notified, the schedule and venue of which will be notified. Those who secure minimum 50% marks each in both objective and descriptive type questions in the Written Test will be considered for Skill Test [Computer Literacy (Post No. 1) and English Short-hand (Post No.2)]. Skill Test will be purely go-no-go basis and marks obtained in the Skill Test shall not be considered for selection. The Skill Test shall be evaluated on a 100 points scale with minimum 60% for qualification. The final selection will be done amongst qualified candidates, purely on the scores obtained in the Written Test. From amongst candidates who qualify in the Skill Test with minimum 60% marks, empanelment shall be done in the order of marks obtained in the Written Test, subject to number of vacancies notified. In case, sufficient number of SCISTIOBCIPWDIEx-servicemen candidates are not available for filling-up the vacancies reserved for these categories, relaxation will be extended to candidates belonging to the respective category, to make good the short-fall. 4. Pay and Allowances: Selected candidates will be appointed as Junior Personal Assistant and Assistant whichever post they applied in the Level 4 in the Pay Matrix (₹ 25500 - ₹81100). The gross emoluments in the minimum of pay band will at present be approximately ₹26775I- p.m. In addition, House Rent Allowance [HRA], Transport Allowance at the prescribed rates in force at the place of posting will be paid for those who are not availing Departmental Housing and Transport facility, respectively. The employees will be governed by the New Pension Scheme. On employment in NESACIDOS, other facilities are available such as medical facilities for self and dependants, subsidized canteen, Leave Travel Concession, Group Insurance advances for construction of house, etc. as per Central Government orders. 5. Other Conditions/Instructions: The posts are temporary, but likely to continue. The appointees are liable to be posted at NESAC, Umiam but are liable to be posted in any of the CentreslUnits of the Department of Space situated anywhere in India as and when required. For details of DOS CentreslUnits, please visit http:llwww.nesac.gov.in. Candidates attending the Skill Test will be reimbursed to and fro second class train fare by the shortest route from the city indicated in the on-line application form to the place of Skill Test (change of address and city for the purpose will not be entertained). No TA will be paid for attending the Written Test. If any information furnished on-line is found to be wrong or false, the candidate will not be allowed for Skill Test and TA will not be paid. NESAC reserves the right not to fill up all or any of the posts, if it so desires. Only Indian Nationals need apply. No interim correspondence will be entertained. 6. It is for the candidate to ensure that helshe fulfills the eligibility criteria and complied with the requirements adhered to the instructions contained in this advertisement as well as in the application form. Candidates are, therefore, urged to carefully read the advertisement and complete the application form and submit the same as per instructions given in this regard. If at any stage it is found that the candidate is not eligible to apply, hislher candidature will be rejected.